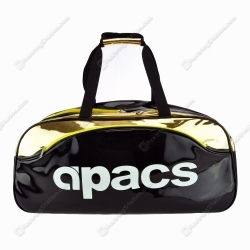 Apacs AP2531 Racket Bag is a sling style shoulder bag for racket carrying. The two main compartments can hold rackets, or be used for shoes/shuttles/bottles/clothing. A side pocket with internal pockets gives storage for grips and valuables. The bag can be carried using either the shoulder sling or with the carry handles.